Regardless of what type of vehicle you drive, there are several ways that you can cut your gas costs while also becoming a better, safer driver. It’s no secret that fuel efficiency and the chances of you getting in an accident or a speeding ticket is dictated by the way you drive. Changing your driving behavior can greatly reduce your carbon footprint, keep you safe while behind the wheel, and even yield large savings in gas costs over the course of a year. Drive Smart. Aggressive driving (speeding, rapid acceleration and braking) wastes gas. It can lower your gas mileage by 33 percent at highway speeds and by 5 percent around town. Sensible driving is also safer for you and others, so you may save more than gas money. Don’t Speed. While each vehicle reaches its optimal fuel economy at a different speed (or range of speeds), gas mileage usually decreases rapidly at speeds above 60 mph. You can assume that each 5 mph you drive over 60 mph is like paying an additional $0.24 per gallon for gas. Observing the speed limit is also safer. “Pulse and Glide” is simply a style of driving that allows you to obtain a desired speed while using less fuel and emitting less pollution. Say for instance the desired speed you wish to maintain is 60 miles per hour. Instead of controlling the gas pedal to maintain 60-65 miles per hour, slowly accelerate to 70 miles per hour (pulse) and then release the gas pedal and allow the vehicles inertia to coast the vehicle down to 55-60 miles per hour (glide). Repeat this over and over throughout your drive. Doing this allows you to carry an average speed of 60 to 65 miles per hour but much by using the “Pulse and Glide” technique, you have greatly increased your efficiency instead of driving along maintaining a steady 60-65 miles per hour. The key to this technique is in the “Glide”. While the “Pulse” does use slightly more fuel then maintaining a desired speed, the “Glide” uses only a fraction of fuel needed to average out to the desired speed. Metrompg.com tested this driving technique with a Toyota Prius and was successful at obtaining a whopping 109.3 miles per gallon average! That is a 54.7 percent increase in miles per gallon over the Toyota’s listed miles per gallon average of 49.5 miles per gallon! Choose the Best Route. It is interesting to note that the most efficient route to take in your driving may not be the shortest. Basically, you want as smooth a trip as possible while being relatively short, and you want to avoid as much stop and go scenarios as possible. Use a GPS tracking device to optimize the best route possible. FieldLogix GPS fleet tracking is one of the best and most eco-friendly GPS systems on the market. Coasting To a Stop. When approaching a red light or stop sign, let off of the gas and coast to the stop instead of remaining accelerated and hitting the brakes when you get there. This will greatly reduce the amount of fuel consumed. Remove Excess Weight. Avoid keeping unnecessary items in your vehicle, especially heavy ones. An extra 100 pounds in your vehicle could reduce your MPG by up to 2 percent. The reduction is based on the percentage of extra weight relative to the vehicle’s weight and affects smaller vehicles more than larger ones. Remove unnecessary object such as golf clubs and camping gear from your vehicle’s trunk. Reducing the overall weight of the vehicle by removing such objects will greatly reduce the amount of energy needed to drive the vehicle around town. Get off the phone! Don’t talk, text, read emails, play games, watch videos, etc. while driving. It’s dangerous and is becoming a huge problem on American roads. If you are having an emergency and absolutely need to read an email or text, then pull over. Turn Off the Air Conditioning. Air conditioning has been said to increase fuel consumption by up to 10 percent. An immediate savings of 10 percent in gas mileage is immediate money saved. Keep the Vehicle Maintained. 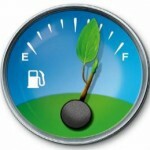 A well maintained car will give off less gas pollution and greenhouse gas emissions than one with dirty oil. Old, dirty oil is not only had bad for your engine, but more energy is required to work the engine through the sludge. Keep the vehicle Streamlined. Keep the windows rolled up while driving at high speeds which will greatly reduce drag. Drag is basically resistance and it causes the vehicle to burn more fuel. A vehicle that moves through the air more efficiently takes less energy to push which translate into less fuel consumption and reduces your carbon footprint. Removal of unnecessary additions to a vehicle such as a bike rack can not only reduce drag, but also can reduce the weight of the vehicle. Lastly, keeping a vehicle clean allows the vehicles body to be smoother for the passing air to slide by. Dirt on a car creates drag and drag cuts fuel economy. Know When To Use Cruise Control. Cruise control can be a valuable tool on the highway to maintain a steady speed, but it lacks the tools that you have in your head. That is, cruise control does not see the hill looming up ahead. Instead it will coast until you are halfway up the hill reducing the vehicle’s overall speed, then it nails the throttle demanding that the vehicle speed increases. By anticipating the hills and valleys you can drive more efficiently by slightly increasing the vehicle’s speed as required to climb the hill without a major loss of momentum. Turn the Engine Off. If you are stopped for on a road for an extended amount of time – such as a train passing, road construction, or an accident – then consider turning the vehicle off after 20 seconds or more. This saves the fuel need for idling as well as eliminates the emissions from an idling vehicle. Check Your Air Pressure. Properly inflated tires can reduce fuel consumption by up to 3 percent. An underinflated tire creates more drag on the pavement which reduces your miles per gallon. Keeping your tires properly inflated allows your vehicle to roll more efficiently.